Weight is the pull of gravity. An object placed near the surface of Earth experiences the pull downward of gravity. This pull, or force, is called the weight of the object. The weight of an object is the pull of gravity on that object. 'F sub g' is often read 'the force of gravity' or 'the weight'. Since weight is a force and force is a vector, weight is a vector. Weight is what causes an object to fall. The downward pull of the weight of an object is the force that causes the downward acceleration of that object. Objects fall because of their weight. Without air resistance an object on Earth will accelerate at a rate of 9.8 m/s2 as it falls. Normally, falling bodies experience air resistance. 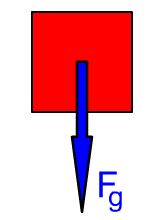 With air resistance, this acceleration would be decreased as the object fell. Under these conditions the object could reach a terminal velocity and speed up no more. Weight happens on any planet or moon. An object would experience weight on any planet or moon. On the surface of the Earth's moon, for example, you would have a weight, you would feel the pull of the Moon's gravity. Your weight on the Moon, though, would be one sixth of your weight on Earth. 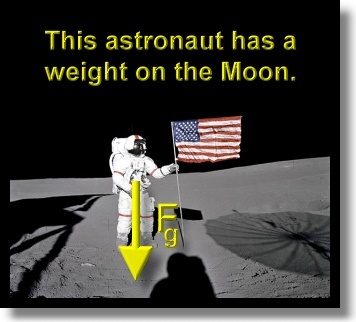 That is because the gravitational field strength on the Moon is much less than on Earth. The term weight usually refers to the force of gravity near the surface of a planet or a moon. We usually use the word weight to refer to the pull of gravity near the surface of a planet. How near? 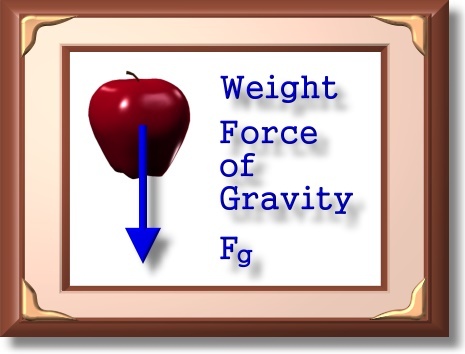 Well, for practical purposes, you can use the word weight for the pull of gravity if you are close enough to the surface so that it appears flat to you. This would be true for locations at ground level up to a few miles high. Certainly the object in the picture above is not near the surface of the Earth. It does still, though, feel the pull of gravity due to the Earth, even at this and greater distances. This is the same force of gravity as weight. However, in situations like this the force of gravity is usually not called the weight of the object. It is simply referred to as the gravitational force on the object. It is a vector, and it is also normally symbolized with Fg. When an object falls, it is pulled down by the force of gravity. This constant force, called the weight, causes the object to accelerate as it moves downward. This acceleration is the same for all bodies (all bodies on the same planet or moon), and it is called the acceleration due to gravity. An object with a mass of 2.5 kg weighs 25 N on Earth. Note that mass and weight are different concepts. This 2.5 kg object weighs 4.0 N on the Moon. Note in the above two problems that the mass of the object is constant; it is 2.5 kg both on the Earth and on the Moon. However, the object weighs more on the Earth than it weighs on the Moon. This is because the gravitational field near the Earth's surface is greater in strength than the gravitational field near the Moon's surface. The Earth's stronger gravitational field pulls harder on 2.5 kg than the Moon's weaker gravitational field pulls on 2.5 kg. The stronger force on Earth causes 2.5 kg to have a greater acceleration while falling than the weaker force on the Moon causes for the same 2.5 kg. Be sure to notice that if the object were taken from the Earth to the Moon, its mass would stay the same, but its weight would change. Weight and mass are related, but different ideas.